Michka® regular cannabis seeds for indoor grows are sure to delight lovers of citrus-scented sativas, and are a fitting tribute to the French grande dame of cannabis! 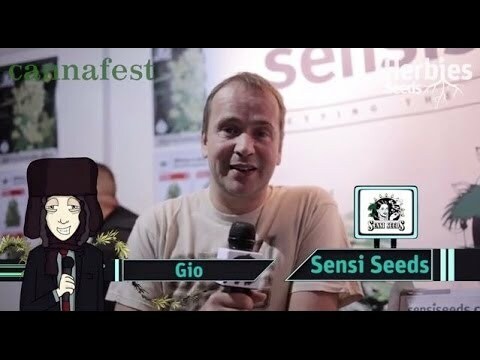 Whilst working on the Eagle Bill® cannabis seed strain, the Sensi Seeds breeders were intrigued and excited by a particular expression of the new line. Tall, elegant, and astonishingly lemony, the plants grown from these seeds were so special that it swiftly became apparent that Sensi had discovered, in this breeding line, the answer to a separate quest – which cannabis variety would be worthy of being named for one of the greatest women in cannabis, Michka Seeliger-Chatelain, known worldwide simply as Michka? Like most sativa-dominant seed strains, Michka® has a long flowering time, and a yield that is definitely worth the extra weeks in quality rather than weight. The plants grow rapidly, and exhibit minimal lateral branching. This cannabis type is definitely in the “bud on a stick” camp! For growers with some experience, Michka® (like Eagle Bill®) can perform well when super-cropped or grown in Sea of Green or Screen of Green set-ups. Expect tall plants. If you have limited ceiling height, the aforementioned techniques are definitely worth considering. In the later stages of flowering, plants resemble solid, spiralling, lime-green candles, their stems invisible within the thick clusters of flowers. The leaf-to-bud ratio is excellent, making for easy trimming and some of the most aesthetically pleasing and graceful colas in the Sensi Seeds stable. Although sativas are renowned for light, fluffy, popcorn-like buds, Michka® draws on the Silver Pearl® side of its breeding heritage to bulk out the flower clusters. Despite being classed as a medium yielding cannabis variety, it has the ability to pleasantly surprise with the density of its colas. Although solid buds can be at risk of bud-rot, especially in the last couple of weeks of flowering, Michka® exhibits such a classic sativa spiral flower formation that this should not be a problem with adequate air circulation. For those living in anything but warm and fertile climates with long, hot summers, Michka® is an indoor cannabis strain. If you are fortunate enough to be growing somewhere that would permit a Haze to complete its lengthy flowering period, however, there is no reason to hesitate in putting Michka® in your outdoor garden. When grown in free soil (rather than pots) this seed type can reach quite staggering heights, increasing your yield as well as making a spectacular addition to your flowerbeds! Sativas are renowned for their gifts of thought-provoking, mind-expanding psychedelic highs, and this 80% sativa is a particularly potent example of this side of the cannabis family. Expect a thoroughly uplifting, cerebral effect, coupled with an energetic high that is very conducive to artistic or creative pursuits, both active – painting or programming, for example – and passive, such as listening to music or browsing through photographs. Michka® has a remarkably long-lasting effect, with no downside of tiredness; this is not a strain to consume if you want to sleep! In terms of flavour and odour, these were the first characteristics to mark this cannabis breeding line out as being worthy of special notice, and eventually as being a strain in its own right. During the vegetation period, the smell is milder, but as soon as the long blooming phase begins the citrus tones intensify and by the time Michka®'s buds are ready to harvest, gently squeezing them will release a wave of bright, fresh lemon with grapefruit top-notes. Once cured, Michka® retains its citrus zing, but develops a certain sweetness that is reminiscent of fruit rather than candy, making it refreshing to smoke or vaporize time after time. Michka unquestionably deserves a strain named in her honour. Known for her free spirit and adventurous life, she is the co-founder of Mama Editions publishing house, the author of various best-selling books on cannabis, its cultivation, medicinal use, history, and social impact. Sensi Seeds is proud to consider her a friend, to sell her books, and now finally to dedicate this beautiful sativa to her!